Spectre of the Brocken. Creative Commons Attribution-NonCommercial-Share Alike image by Denis Vailhé. In the 1880s, Charles Wilson was a bright young student from Scotland. He initially studied biology, intending to become a doctor, but his interest drifted towards physics. By 1890, he was a student of J. J. Thomson at Cambridge University, who we've heard a lot about already. 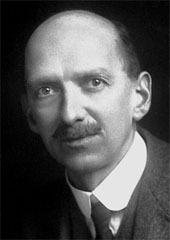 Thomson was interested in atoms, and would discover the electron in 1897. But by 1893, his student Wilson had graduated and returned to Scotland to take up a career in science for himself. Wilson was interested in the physics of weather, and particularly in clouds and cloud formations. Ten years earlier, the Scottish Meteorological Society had set up a weather observatory on the summit of Ben Nevis, the highest peak in Scotland and the British Isles. Wilson spent a stint there, observing and recording the mountain weather. 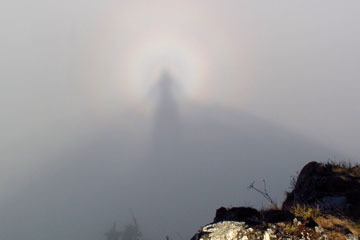 While there, he witnessed the spectacular Spectre of the Brocken phenomenon. This is an optical phenomenon, named after the Brocken peak in the Harz Mountains of Germany, where it can frequently be observed. This low peak is easily accessible to walkers and is often shrouded in patchy fog. These combine to provide the perfect viewing conditions. When the sun is low in the sky, near sunrise or sunset, its rays can shine almost horizontally, casting the shadows of people near the summit not on to the ground, but on to the adjacent fog. The result is a ghostly shadow of a person looming over the observer. The spectre can appear huge because of the projection effect, and the shape can be distorted by the irregular structure of the fog. Perhaps because of this, the Brocken mountain is known in local myth as a residence of witches and devils of various sorts. Goethe alluded to this in his play, Faust. The weather conditions around Ben Nevis in far away Scotland are also conducive to sightings of this spectral apparition. Wilson was so impressed by it that he was driven to study the optical effects and how they interacted with the physical structure of the clouds. The trouble of course, is that the weather can be terribly uncooperative when it comes to observing transient phenomena like this. Ultimately, what Wilson needed was a way to study clouds in the laboratory. So he looked for ways to make clouds. Condensed droplets of water in the air. He came up with the idea of taking a container full of air and adding water vapour to it until the air was saturated with water; in other words, it was extremely humid. Then he pulled out a piston attached to the chamber, to quickly lower the pressure inside. This results in the temperature inside the container dropping suddenly. This is because molecules of air and water bouncing off the moving piston were reflected at lower speeds, thus reducing their kinetic energy, and hence the overall temperature of the gas. The thing about air and humidity is that warmer air can hold more water vapour than colder air. 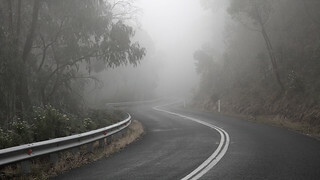 If warm air is very humid, and the temperature drops, it can no longer hold all of the water as invisible vapour. Instead, the water condenses out into tiny droplets that hang in the air, forming a visible mist. This is what happens when hot air saturated with water vapour from the inside of a boiling kettle emerges into your kitchen, which is much cooler. The sudden drop in temperature causes the previously invisible water vapour to condense into a cloud of swirling mist that you can see. This also happens on a much larger scale when a mass of relatively warm, humid air such as you get over the sea moves into a cooler region, such as on to land at night. The water vapour condenses out and produces what we know as fog. Fog is really just a very low sort of cloud. If you climb a mountain to a height where clouds form, and one drifts by, you see that it's really like being in a thick fog. You can perhaps more easily see the same thing when on an aeroplane, flying through a layer of cloud. Water molecules attracted to an electron (not to scale). Adapted from Creative Commons Attribution-Share Alike image by Czech Wikipedia user Qwerter, vectorised by Wikimedia Commons user Magasjukur2. The other thing about air and humidity is that when the air is holding a lot of water and is ripe for cloud formation, the water vapour can use a sort of kick start to get it condensing out into water droplets. If there's a speck of dust or something floating in the air, the water will be attracted to its surface, where it will find similarly attracted water molecules and they can start sticking together to make a water droplet. This process is called nucleation, because the speck of dust acts as a nucleus around which the condensation occurs. So cloud formation is helped along by the presence of airborne dust particles. If there's dust in the air, that's where the clouds will start to form first. That's not all that floats around in our air though. Another common form of solid matter in our atmosphere is bacteria. These tiny single-called life forms are pretty much everywhere you can think of on Earth. Fairly recent research has shown that they are an important, perhaps even dominant, factor in cloud nucleation. Another thing that potentially exists in the air is electrically charged particles. Despite being much smaller than dust or bacteria (more like the size of atoms), charged particles are also good nucleation centres. 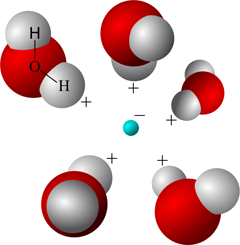 Water molecules are made of two atoms of hydrogen and one of oxygen. Three atoms could join up in a straight line, but because of the distribution of electrons in an oxygen atom, the hydrogen atoms end up sticking out at angles somewhat reminiscent of Mickey Mouse ears. This shape results in an uneven distribution of electric charge over the whole molecule. The side with the two hydrogen atoms on it ends up slightly electrically positive, while the side with the oxygen atom is slightly negative. This imbalance means that water molecules tend to be attracted to electric charges. If there's a charged particle in humid air, water molecules start to crowd around it. This is enough to initiate nucleation of water droplets and the formation of clouds. Where can charged particles come from in our atmosphere? Interestingly, they can come from outer space! Zooming through space are countless subatomic particles, blown off by stars or released in the enormous supernova explosions that end the life of a massive star. These particles zoom through space at speeds close to the speed of light. Many of them hit the Earth. Such particles arriving from the depths of space are called cosmic rays. The vast majority of them (about 89%) are protons - or in other words hydrogen nuclei: hydrogen atoms with the electron stripped off. A small number (10%) are helium nuclei - tightly bound bundles containing two protons and two neutrons. The remaining 1% is made up of a mix of electrons and the nuclei of heavier elements. Charles Wilson. Public Domain image from Wikimedia Commons. The effect of cosmic rays would not be discovered until 1912, and not explained until the 1920s, well after Wilson's cloud formation experiments. But there were other sources of rapidly moving electrically charged particles - these were the things that people like his doctoral supervisor J. J. Thomson were working with: cathode rays and radioactive sources. Cathode rays are essentially streams of rapidly moving electrons, generated by applying a voltage across electrodes inside a vacuum tube. Because of his student experience with these, Wilson had such devices handy when doing his cloud formation experiments, and noticed that the presence of charged particles helped initiate cloud formation in his experiments. This is just the sort of unexpected interaction between seemingly unrelated physical phenomena that prompts a curious scientist to investigate further. At this time, there was no reason to think that electrically charged particles had anything to do with clouds. So, intrigued, Wilson performed more experiments, deliberately introducing charged particles to his artificial cloud chamber. With careful experimenting and precise control over the humidity, pressure, and temperature in his apparatus, Wilson realised that he could create conditions inside the chamber such that when a single charged particle moved through it, it would nucleate droplets of water along its path, but nowhere else in the chamber. This meant that the charged particle would leave a trail of condensed water droplets through the humid air inside the chamber. And if the walls of the chamber were made of glass, you could see this trail. What Wilson had invented was a way to see the paths of individual electrically charged particles as they moved through the air. He verified this by placing his apparatus near a magnetic field. The electromagnetic interaction of a particle with the field meant that it should curve through the air, as the magnetic field deflected the moving electric charge. And this is exactly what he saw. This step confirmed that what Wilson was seeing was indeed the tracks of individual charged particles. He had invented a way of seeing what was far too small to see by any other means. 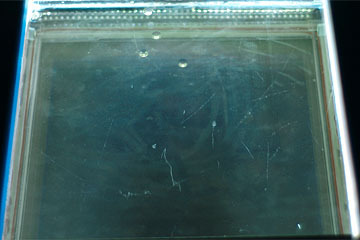 Particle tracks in a modern cloud chamber. Creative Commons Attribution-NonCommercial-Share Alike image by Bill Liao. Wilson named his invention the cloud chamber. His painstaking research and development (mixed with other studies) had taken until 1911 to perfect the device. Atomic scientists adopted it with enthusiasm and quickly improved upon Wilson's version by using alcohol instead of water - its propensity to evaporate quickly made it easier to set up and recycle the chamber contents to observe particles in rapid succession. The cloud chamber became a standard tool used by physicists probing the structure of the atom and the nature of radioactivity over the next few decades. In 1927, 21 years after his doctoral supervisor J. J. Thomson had been awarded the Nobel Prize in Physics for his work on the electrical properties of gases, Charles Wilson was also awarded the Nobel Prize, for his invention of the cloud chamber. The scientific interests of a single person can range far and wide. From biology and medicine, through physics, to meteorology and optical phenomena, Charles Wilson was one of those people who managed to combine a quirky fondness for such things as clouds with fundamental physics in a way that nobody had thought of or even considered before. The intersection of these previously unrelated fields led to the discovery of a phenomenon that led the way and paved the foundations for the next century in an area of physics that was just being born. Now, physicists had a way of seeing and studying the paths of subatomic particles. Particle physics had been born. Dan Arthur, M.S. in atmospheric science, specialising in cloud microphysics at Purdue University, writes to say that the traditional explanation of air having some "holding capacity" for water vapour, and that holding capacity changing with temperature, is not merely a simplification of the physics into layman's terms, but is essentially incorrect. 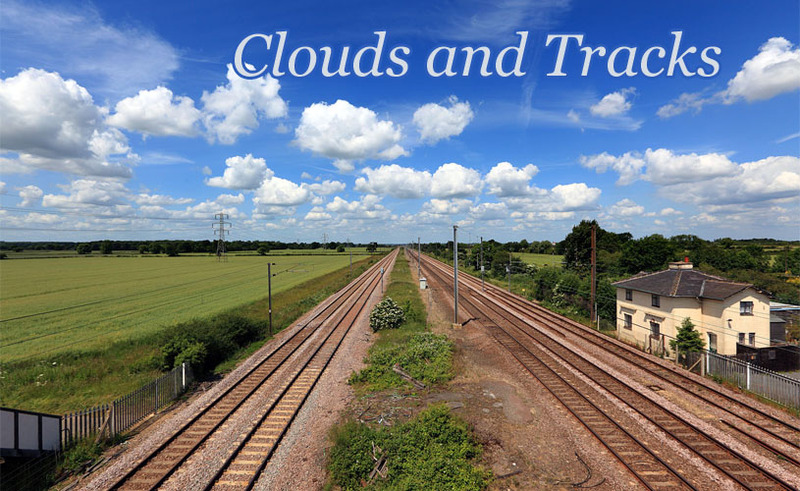 A more thorough and physically correct explanation of why clouds form when the temperature drops is given on Alistair Fraser's Bad Meteorology site (a sister site of the better known Bad Astronomy site, both dedicated to correcting scientific misconceptions). Put simply, gaseous water vapour and liquid water droplets exist in an equilibrium state in which molecules switch from gas to liquid and vice versa at equal rates. If the temperature drops, the condensation rate rises and the evaporation rate falls, until the equilibrium re-establishes itself at a new state where there are more water droplets than before. Betrayingly, this happens even in the absence of air. So the idea that the air "holds" a certain amount of water vapour is a simplification that is slightly over-simplified from a physics point of view. Last Modified: Thursday, 30 January 2014; 00:01:02 PST.